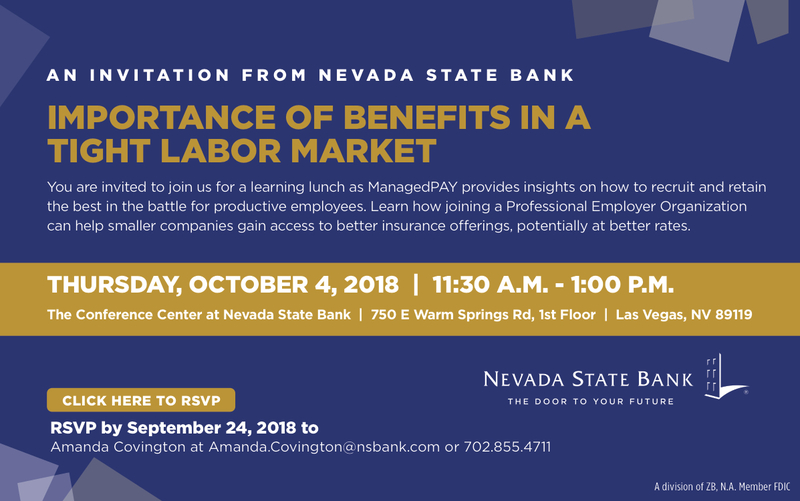 ManagedPAY is pleased to be working with Nevada State Bank to offer a free learning lunch workshop on the topic: “Importance of Benefits in a Tight Labor Market.” The seminar will take place Thursday, Oct. 4th from 11:30am to 1pm at Nevada State Bank, 750 E Warm Springs Rd. in Las Vegas. During the seminar, ManagedPAY’s Human Resources experts will provide insights on how to recruit and retain the best and most productive employees and how to utilize benefits to attract talent. This presentation will also cover the value of using a Professional Employer Organization to access better insurance offerings at potentially better rates. This valuable primer on recruiting, retention, and benefits is completely free and lunch will be provided. PLEASE RSVP in advance to ensure we will be able to accommodate you. RSVP to Amanda Covington at Amanda.Covington@nsbank.com or 702-855-4711.